(Medical Xpress) -- Early detection of breast cancer saves thousands of lives each year. But screening for breast cancer also produces false alarms, which can cause undue stress and costly medical bills. Now, a recent study using patient blood reveals a possible way to reduce the number of false alarms that arise during early screening. 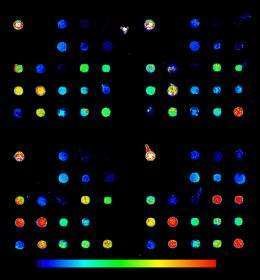 Researchers found a panel of proteins shed by breast cancer that are easily detected and can distinguish between real cancer and benign lumps. This study used diagnostic tools that are already in use in clinics. If the results can be replicated with more volunteers and over a longer period of time, the transition from research lab to clinical lab would be straightforward. "We were surprised to see we could distinguish between accurate and false results produced by cancer screens such as mammograms," said Department of Energy's Pacific Northwest National Laboratory biologist Richard Zangar, who led the study published in the July issue of Cancer Epidemiology, Biomarkers & Prevention. "We really want to expand the work to verify our findings." Finding breast cancer is the first step to treating it, but mammograms have a high rate of false alarms. Many women go through unneeded, invasive follow-up tests. To improve the process, some researchers are working on a simple clinical blood test that would detect proteins shed by cancerous tissues. Called biomarkers, these proteins aren't doing much better than mammograms when it comes to false positives in experimental studies. But researchers have been approaching biomarkers as if every type of breast cancer is the same. In reality, breast cancer exists as several subtypes, with each subtype having distinct characteristics. For example, breast cancers that produce proteins called estrogen receptors are a different subtype from ones that don't and respond to different therapies. Zangar and colleagues wondered if looking for biomarkers specific for different subtypes would improve the odds of getting the diagnosis right. To explore this idea, Zangar and his colleagues at PNNL and Duke University picked 23 candidate biomarkers and measured them using tests similar to the ones found in clinics. The team compared proteins in blood from four groups of women  about 20 women in each of the four subtypes of breast cancer  to women with benign lumps that had previously been identified as false positives. Then, Zangar's team homed in on a handful of biomarkers for each subtype that could best distinguish between the most true positives and the least false positives. The biomarker panel for each subtype was significantly better at distinguishing between breast cancer and benign lumps than mammograms or single biomarkers. The statistical test the team used rates performance from 0.5 to 1.0  with 0.5 indicating the biomarker panel predicts cancer randomly and 1.0 means it's perfect. Mammograms and the best single biomarkers rank around 0.8. But for two of the most common breast cancer subtypes, the biomarker panels ranked above 0.95 and reached 0.99 depending on which proteins were included in the panel. "Perhaps researchers haven't found good biomarkers because they've been treating the different subtypes as a single disease, but they actually represent unique diseases that are associated with different biomarkers," said Zangar. "We're hopeful these results can be repeated because these assays would markedly improve our ability to detect breast cancer early on, when treatment is more effective, less costly and less harsh." In addition, the study hints about the underlying biology of breast cancer. Four of the biomarkers are proteins involved in normal breast development that turn on and off at different times during growth. The fact that these proteins show up in different ways, depending on the subtype of breast cancer, might provide clues about what goes wrong when breast tissue turns cancerous. The team is seeking additional funding to repeat the study in larger groups of women and to follow volunteers for several years. More information: Rachel M Gonzalez, et al., Plasma Biomarker Profiles Differ Depending on Breast Cancer Subtype but RANTES Is Consistently Increased, Cancer Epidemiology, Biomarkers & Prevention, July 2011, DOI 10.1158/1055-9965.EPI-10-1248 (http://cebp.aacrjournals.org/content/early/2011/05/16/1055-9965.EPI-10-1248.short).